Bear meat: How I ended up with 60 pounds of it, and cooked it all. What do you do with a fridge full of bear parts? 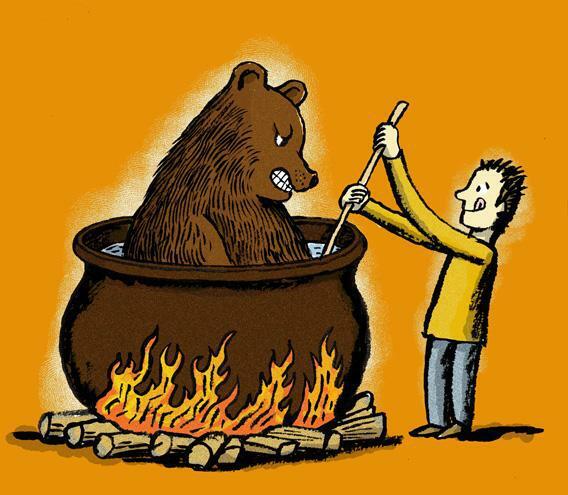 Bear, it’s what for dinner. The growl of my truck engine dropped an octave as I shifted gears to climb a hill and then began making my way around a bend. The twisty road in the woods of Central Virginia was dappled with late-afternoon sunlight. My mind was on what I would make for dinner—I wondered whether I had any sour cream—until I came around the bend and saw an SUV stopped in the middle of the road. I slammed on my brakes and squealed to a stop. I dragged the bear out of the road so traffic could start moving again, and then I waited for the police to arrive in order to obtain permission to keep the bear. (Being in possession of a dead bear outside of bear-hunting season can get you charged with poaching unless you get special approval.) I had realized that this was as perfect an opportunity as I would ever have to find out what bear meat tastes like. Disassembling a 150-pound dead bear wasn’t what I’d had planned for the evening (I’d intended to catch up on The Walking Dead), but I’m a carpe diem kind of guy. An hour later I found myself the proud, legal owner of one dead black bear. Black bears look like a cross between humans and big, silly dogs. The idea of eating one had always seemed just shy of cannibalism to me. I hunt deer regularly for food, but I had never eaten–let alone butchered–a bear. But is there any good reason the bear should be a sacred cow? Especially a bear that was already dead? There was nothing unethical about eating an animal in this situation, except maybe by the very strictest vegan standards. It wasn’t moral revulsion that I had to get over, exactly—it was more like neophobia. However, as a hunter and writer specializing in killing and eating invasive species (a great way to eat sustainably and help the ecosystem at the same time), I’ve had to force myself to get over hang-ups about food on many occasions. The butchering was easier than I had expected. With the exception of removing the paws, it wasn’t much different from working on a deer. The fur was longer and thicker, but the hide wasn’t much tougher. The bone structure of the lower limbs was radically different, though: The bones were much thicker, and they were surrounded by numerous broad sinews. Everything in those limbs communicated power–while also reminding me a bit of human anatomy. Within a few hours I had a fridge full of around 60 pounds of bear meat.